Sweet Potato Hummus is a little sweet, a little spicy and a lot delicious! This hummus is healthy, quick and easy to make, and vegan. With Football season means it is tailgating time! Whenever I’m tailgating, at a barbecue, picnic or party, the first thing I look for is something healthy, like fresh vegetables. And if there is something healthy to go with them, such as hummus, I am a happy girl! It just so happens that ‘tailgating’ is the theme for this week’s Sunday Supper, and I am bringing to the party a healthy treat to go with that ~ Sweet Potato Hummus! Who would have thought the addition of sweet potato to a basic hummus recipe, along with some spice and some heat, would result in such a tasty (and healthy!) dip. Paprika and chipotle seasoning really enhance the sweet potato and are otherwise complementary to the traditional hummus flavors. Sweet Potato Hummus is also very easy to make and a wonderful accompaniment to a vegetable tray, pretzel crisps or whole wheat pita chips. It would also be great on a wrap or as a sandwich spread. 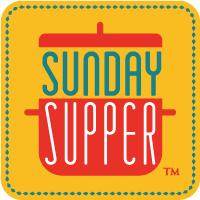 Be sure to check out what the rest of the Sunday Supper group brought to our Tailgate party! Put sweet potato, chickpeas, tahini, lemon juice, olive oil and garlic in a food processor, and process until smooth. Then add paprika, cumin, brown sugar and chipotle or cayenne pepper, if using. Process again to combine spices. Taste and adjust spices and/or sugar, to your taste preference. Serve with pretzel crisp, carrots, broccoli, red bell pepper, or your favorite crudites. Very cool recipe. I make hummus at least once a week. I need to branch out from my basic hummus and try new flavors. I love sweet potatoes, looking forward to this one. Healthy dips are must-have for my tailgating/football days! Combining sweet potato AND hummus…genius! Love hummus love sweet potatoes! Whats not to love in the recipe!! Wow! This is perfect for fall…although I eat sweet potatoes any time of year. Oh, sweet potato hummus…what an awesome combo. A little sweet, a little smoky/spicy…I need this in my life! This is such a great idea. I love hummus and sweet potatoes. I am making this for sure! We love Hummus and never thought to use sweet potato. What an awesome recipe! What a fun twist on traditional hummus. I love the addition of the sweet potatoes instead! Hubs is always requesting I make hummus–can’t wait to try this one–he’s going to love it! It’s amazing how versatile sweet potatoes are! I can’t wait to try this! Hummus isn’t my favorite but the flavor of the sweet potato would make me fall in love for sure! My sweet potato loving heart just went pitter patter. I have to venture out there and make my own humus! I love sweet potatoes so this is a bonus! Thanks for sharing!